What you need to know before you go: All occupants of the vehicle must have a signal safety vests. Do not forget to buy a vignette for toll highways in Austria; the vignettes are sold at the border gas stations. If you want to visit popular ski resorts and enjoy the views of the Austrian Alps, it is best to drive to Innsbruck with a stop in the Ziller river valley (Zillertal). It is relatively close to Munich, about 2 hours one way. This trip is interesting at any time of the year even if you are not a big fan of downhill skiing. For example, we went there in mid-April, when the ski season was almost over. 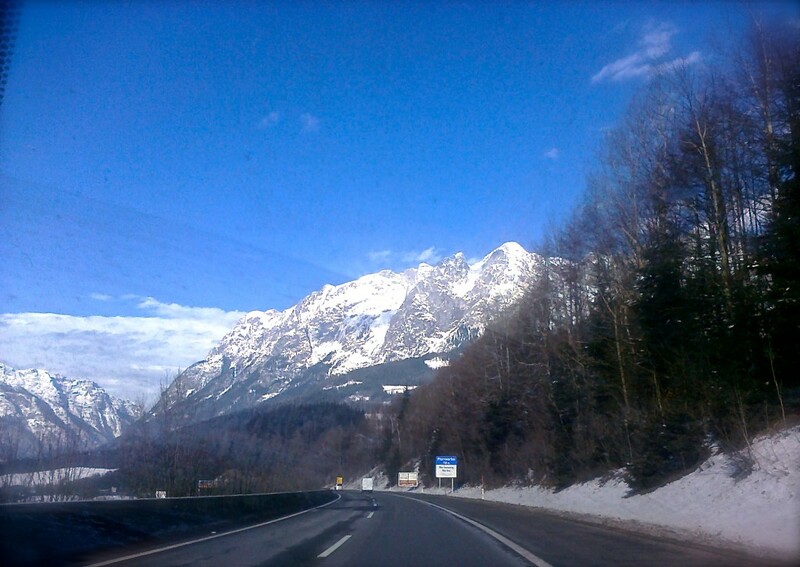 We left Munich at 9 am on the A8 autobahn and then turned onto the A93 autobahn in the direction of Innsbruck. Suddenly, the mountains appeared in front of us and soon we were surrounded by them. About 40 km (25 mi) before Innsbruck we turned to Mayrhofen, the main resort in the Zillertal valley. Mayrhofen is located on a provincial road, about 30 km (20 mi) from the autobahn; we reached it 11 am. We left the car on the public parking (Ahornstr. 853, 6290 Mayrhofen) and went for a walk. Mayrhofen is a picturesque alpine village with beautiful typical Tyrolean houses. This cozy and relatively inexpensive resort is usually is full of tourist. However, April is the beginning of a dead season, so it was not so crowded. Interestingly, the summit, which is more than 2000 meters (6500 feet) high, was still covered with snow, the cable-car lift was still working and some people were still skiing. While we were ascending, we saw hang-gliders leaping from the mountain right next to us. There were so many of them, that it looked as if a flock of colorful birds were hovering over the valley. A very beautiful sight. We spent 20 minutes on the summit enjoying views of the surrounding mountains and then descended back to the valley. It was noon already. We had lunch in the restaurant of the Kramerwirt hotel in the heart of the village. The food was delicious. 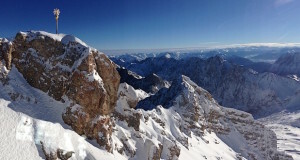 Then we continued on to Innsbruck. It was about 70 km (43 mi) drive and it took us about an hour. At 2 pm we arrived in Innsbruck. 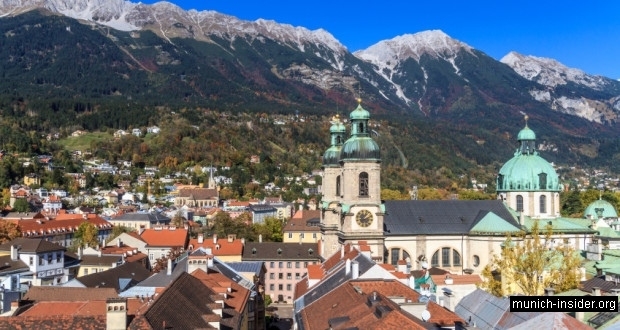 Innsbruck, the main city of Tyrol, is a rather small city. It is known worldwide as the capital of two Winter Olympics, but we were interested in other things. Many Austrian cities are famous for lavish palaces and castles filled with luxurious items. All this thanks to the Habsburg dynasty which ruled Austria for many centuries. They were great art lovers and collectors. Our goal was to see the two famous Innsbruck’s palaces, Hofburg and Ambras. Hofburg, the former provincial residence of the Habsburgs, is located in the heart of the city. Address: Rennweg 1, Innsbruck. The palace itself looks somewhat unsophisticated in comparison with the famous Viennese Imperial Palace bearing the same name. However, it is cute and cozy. Its light-colored exterior walls are in pleasant harmony with the surrounding mountain peaks. Once it had been a rather gloomy 14th century castle, but later it was rebuilt into the Rococo style palace. We had just a brief stroll through the palace halls, but still felt the atmosphere of importance which likely had felt the Habsburgs living or having a retreat here. Well, of course, the royal family could afford all this luxury and splendor. The Ambras castle is located in the eastern part of the city; address: Schlossstrasse 20, 6020 Innsbruck. It was almost 4 pm, so we were just in time before the closing of the ticket office. Ambras is also a former medieval castle, later rebuilt as a palace for the residence of the royal court. Situated on a hill surrounded by alpine meadows the castle is very beautiful. We had only an hour before closing, definitely not enough time to see everything. Here is what we managed to see. Around the castle, there is a very beautiful park with a lake where swans and ducks swim leisurely. Peacocks promenade around. It is such a nice place to relax. Inside the castle there is a portrait gallery of the entire House of Habsburg; many portraits were painted by famous artists. For several centuries it was the most powerful royal family in Europe. I had a long look at these faces; some looked bombastic and with swagger while I did not find anything special in the others. A quite diverse and interesting collection of knights’ armor is also in the castle. It really strikes how short medieval knights were. They say that there are ghosts in the cellars of the castle, but we did not have time to go down there to get some scare. The castle closed for visitors at 5 pm and we went back to Munich.